Oh yes, friends! February 16th and the mercury rose to a welcome 45 degrees. When I walked out of work today, I felt warm, moist air and it was NOT dark. Not completely, anyway. There was light still pushing up around the horizon to the west, south, and north. After eight weeks of dirty snow on the ground, gray skies, subzero temperatures, and pitch dark parking lots after work there appeared a glimmer of life! Hurrah! Hurrah! The blood thinned, the eyes lit up, skin glowed. People looked at each other and smiled again! No more head down, eyes slit to keep out ice pellets, shoulders hunched to prevent wind from blasting sneakily down the collar. No more staring at the feet to avoid treacherous patches of ice and ankle twisting clumps of frozen snow. No more coaxing of car batteries! No! No! We threw off coats, cast hats aside, stuffed gloves into a pocket or a glovebox. Today everyone walked upright, laughing and talking, looking up at the sky. Most didn’t even know they had changed. (Rumor has it tomorrow will be warmer still!) I am transformed! In the nick of time, I am transformed! Today, I emerged from the body of an overeating, sleepy, unmotivated, apathetic mammal on the verge of giving up to a woman with THINGS TO DO! Lest we get carried away, friends, I point out that we have two to four more messy little snows to shovel. March will be cold with the occasional teaser day when temperatures soar to 58 degrees for an hour or so. April will be a muddy mess with a few more days with temperatures that sore to 62 for two or three hours. We’ll get a hard frost every few days. We can’t plant things until Mother’s Day, mid-May, so will be in torment for 3 months yet. Hope springs eternal and this keeps us sane, desiring the Easter green of new leaves and the miracle of a fern unfurled before our eyes. The hope friends, oh the glorious, spectacular, unavoidable, joyous hope! It was as though the blood in my veins had been replaced with a light giving fluid, sun coarsed through me and all was right with the world! This careening sense of goodwill manifests itself in garden thoughts and and irrational desire to force my hands into the black dirt of the plant beds too early. (Which only results in super cold, unpleasantly stiff hands.) Instead, I pull out garden books and seed catalogs and back issues of Farm and Ranch Living and enjoy watching Amos and Rascal inspect the snow-free, muddy kingdom they call theirs. I am compelled to review photographs of last year’s plants and think about what to dig up, what to move, which plants need more sun, less damp, more dry. What needs to be split this year, whether I can put it somewhere or whether I need to find willing recipients for my green offspring as they are divided. What tender seedlings I should start in the house in April, what early blooming annuals do I want to fill in the sun perennial beds? 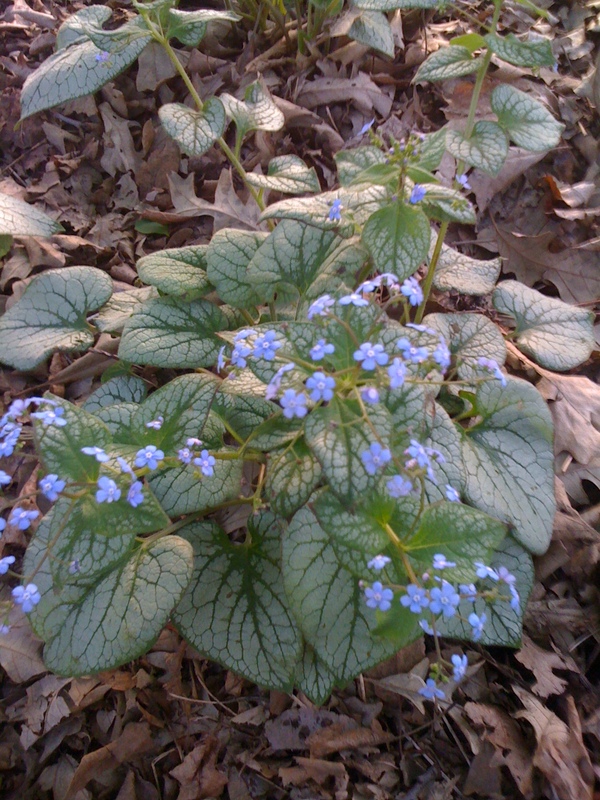 Time to guess which week each early shade perennial will appear, green nose poking up to sniff the spring chill. Will it be primrose? 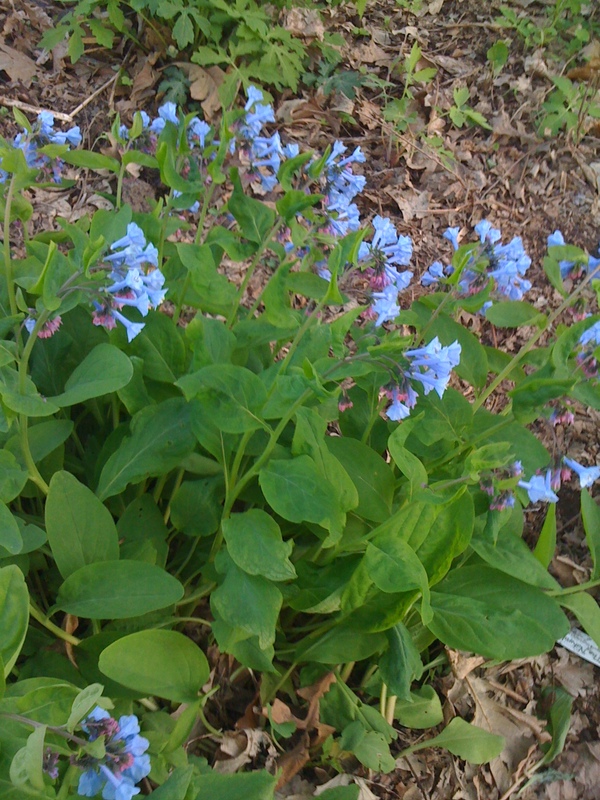 Pulmonaria? Daffodils? 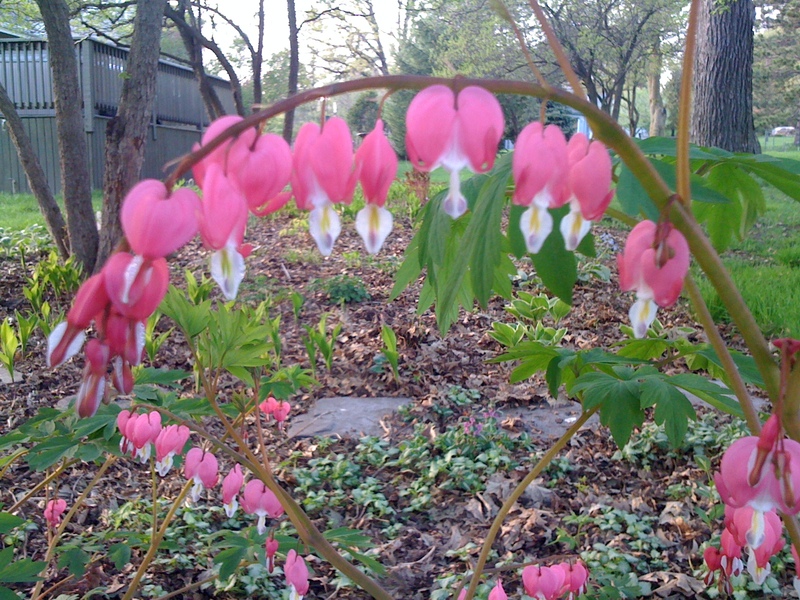 Bleeding hearts in all their pink glory? The crimson Trillium of my heart? Sweet, delicate Lenten roses, those hearty creatures; shy, blushing, waxy creatures that keep their faces lowered? I tremble to think of it, friends. The stately purple iris? She teases me for weeks as she springs from tiny sprout to four foot slashes of green topped with royal purple velvet crowns that send me reeling! OH! 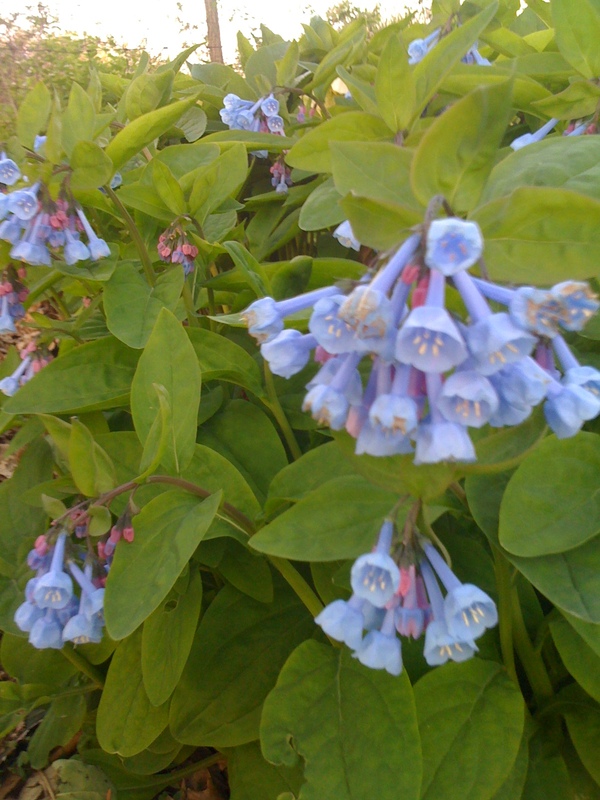 Will it be Virginia Bluebells? They work all winter, you know, colonizing and spreading in preparation for the Spring Show. Or this one! The Gardner’s Bed Book, by Richardson Wright is a new addition to my library, courtesy of the big sister who understands my plant-y side. How about this: “Now frankly, the Tuberose is not the sort of thing a normal man would elect to grow to excess. I have only a few of them – the Double Pearl and the loose-flowerd Mexican Everblooming – tucked away here and there in the borders. 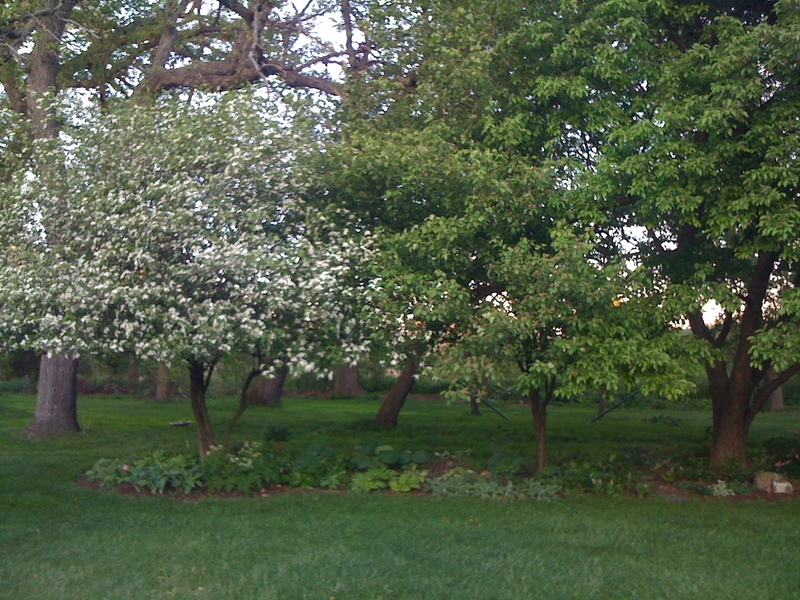 I grow them on request, and their scent has an almost fatal attaction to women. Their buds are parceled out, I find, to women callers who forthwith become romantic… From remarks about it, it appears to be the flower of forgotten lovers, lovers sufficiently forgotten to be safe.” Swoon here, friends. Who needs illicit love with a damn tuberose in the yard, I ask you? Just step outside and inhale and love is yours in memory or in real life or wherever you need it. Oh what a difference a day and thirty-five degrees make! Hope springs eternal. I can do the next three months now. -thanks for taking me along. Winter does seem to be in remission. You’ve found your writing niche, I believe! 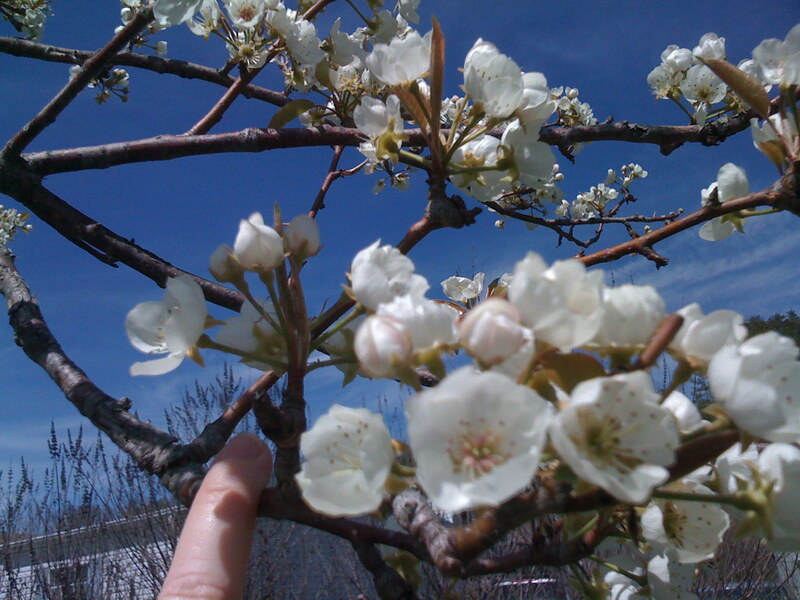 What a beautiful ride into Spring – I loved it! Wheeee! Here we go! Thanks for the kind words!